There’s a good reason why so many events happen at Fuji Speedway. It’s one of Japan’s biggest and most famous race circuits. Its close proximity to Tokyo helps too; if you’re lucky you can get there in an hour and a half or so. Plus, it provides a beautiful backdrop. So I’m not going to complain when the Ferrari Club of Japan’s annual track day is held here and not at any of the other tracks in Japan—especially when it was this much of a spectacle. 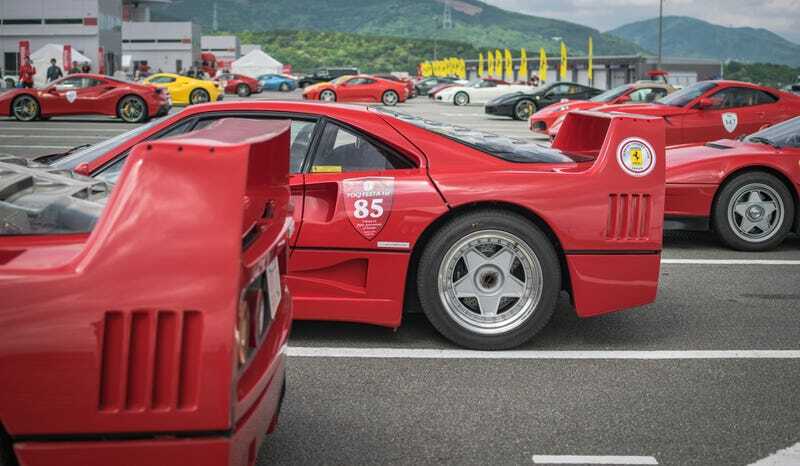 This was the seventh year Japan’s Ferrari owners have held this track day, but what made this year more special was they teamed up with Cornes, an official Ferrari dealer in Japan, and for the the first time made it open to the public. The Ferrari Club of Japan Festa was the first of its kind, but hopefully it won’t be the last. Certainly an event with more than 300 Ferraris in attendance should be something to continue every year and bring in more people to admire and appreciate these cars. If there’s a car company known for their exclusivity and disregard for the unwashed masses, it’s Ferrari. But this time the general public were able to watch this event for a small entry fee, making it too good of an opportunity to miss. As much as Japan is known for its outrageous and sometimes questionable modifications of supercars, their concours-quality and immaculately maintained exotics are just as renowned. The half dozen or so F40s in pristine condition were a testament to that. One of the highlights from the day were the Corse Clienti cars. This is the program where Ferrari looks after the racing cars owned by their customers. There were various GT and Challenge cars as well as a 599XX Evo and even a Formula One car. These were supposed to do demo runs, but the F1 car had some technical difficulties, and for some reason the 599XX just stayed inside the pit garage. Regardless, there were still plenty of other Ferraris to keep us entertained as they made their way around Fuji Speedway. Owners who wished to take their cars out onto the track—I mean, as much as this was a club gathering it was also a track day so why not—had two choices: the ‘Active Family’ run, a casual and gentle drive around the circuit, and the ‘Free Sports,’ meant to be where drivers could explore and exploit the limits of their cars. The former had six rounds and was where we saw things like the F40s, Speciale As, and California Ts. But the people participating in the Free Sports runs were not holding back. Seeing legendary cars like the Ferrari Enzo, F40, and 599 GTO go hard around Fuji was something you’d only expect to see on a video game. Even more so than them, it was the people the 458, 488, FF, F12, 550, and 360 who were pushing their cars to their limits. The guy in the Grigio Alloy 360 Modena actually had a bit of a spin, causing a yellow flag. Luckily he held it and didn’t have too much damage. Unfortunately a white 458 Spider did have an unfortunate crash around the first corner which brought out a red flag. Luckily the driver wasn’t injured, but the car looked like it was in a pretty bad shape. These things do happen on track days. Watching from the slalom after the Dunlop corner was a great vantage point, if not sometimes frustrating. Far too many times cars would either understeer around the first bend or miss the corner completely and drive straight through. In between the cars going out on the track it was worth taking a look around the paddock and pit garages where the rest of the 300 plus Ferraris were parked. Throughout the day people would come and go, adding or taking away from the sea of red at Fuji. They did do a classic car parade, but only a handful of cars participated. Still, there were about three 365 GTB/4 Daytonas, at least six F40s but possibly more, a couple of 246 Dinos, and several of the 328/348/355 V8 models. Inside the pit garages were where some of the exciting stuff were hiding. In one garage there were three LaFerraris, two of the new Apertas and one Coupe. In another were two F12tdfs, a black LaFerrari, a yellow Enzo, a Scuderia 16M, and a Speciale A. Inside another was another F40, a 575 Superamerica, a 246 Dino, and a Daytona. You get the idea; basically in every garage there was something rather special. Of course being Japan, there couldn’t not be any modified Ferraris, and a couple manage to sneak their way in. The green chrome-wrapped 458 with yellow highlights stood out among all the red cars, as did the matte orange 355. There was a chrome candy red 360 Spider too. One of the more interesting modified Ferraris was a Testarossa with a custom body kit that removed the slants along the door. I certainly hope this Festa won’t be the last public one. People deserve to see and hear some of the best Ferraris in Japan on one of Japan’s best circuits.